Hereâ€™s a secret: I would not post coconut based recipes such as this and Coconut Mango or Coconut Semolina if it werenâ€™t for you. The feedback I received from them was very positive and I have received a lot of requests for recipes with coconuts. For todayâ€™s recipe with Pineapple and Tofu will deserve equal credits as coconuts do. I also added Cabbage and Zucchini to the mix to balance out the sweetness from Pineapples. You can also choose any other vegetable option like Carrots or Broccoli. The important part is you have to check how sweet the pineapple is and adjust accordingly. The next important spice in this recipe is the red peppers. The flavor mix from peppers and coconut is reminiscent of Thai cuisine, but this dish is more of a fusion of Thai and Indian cuisines. Last but not least, the Tofu you need will need for this dish is the â€œmedium firmâ€ type. You definitely do not want them falling apart in your curry when it is too soft. Let me know how your curry turns out. As always, keep the comments coming. You can leave a comment on this page or on my Facebook page. For more recipes please subscribe through email. Place a pan over medium heat and sautÃ© garlic, ginger and red chilies with 1 tsp oil until the garlic turns golden.Â Blend them with coconut milk to a smooth consistency and place it aside.Â Now, place another pan on medium heat and saute onions with 3 tsp oil. When they turn golden and transparent, add cabbage and continue to sautÃ© for 3 minutes.Â Add Zucchini, Pineapple and Tomatoes let them cook for 2 minutes.Â Add salt, turmeric powder, and ground black pepper.Â Stir well and cover the lid for 5-8 minutes. As the vegetables soften, add Tofu, blended coconut milk, chili paste.Â Let it simmer for 5 -8 minutes with the lid on. Add Coconut cream. Mix well.Â Turn off the heat and garnish with cilantro. 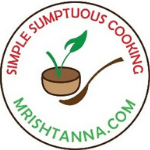 Simple Pineapple Tofu Curry is ready to serve with steamed Jasmine rice or Indian Rotis. Thatâ€™s a Sumptuous dinner cooked in 30 minutes! Place a pan on medium heat and sautÃ© garlic, ginger and red chilies with 1 tsp oil until the garlic turns golden. Blend them with coconut milk to a smooth consistency and place it aside. Now, place another pan on medium heat and saute onions with 3 tsp oil. When they turn golden and transparent, add cabbage and continue to sautÃ© for 3 minutes. Add Zucchini, Pineapple and Tomatoes let them cook for 2 minutes. Add salt, turmeric powder, and ground black pepper. Stir well and cover the lid for 5-8 minutes. As the vegetables soften, add Tofu, blended chili paste. Let it simmer for 5 -8 minutes with the lid on. Add coconut cream, stir well. Turn off the heat and garnish with cilantro. 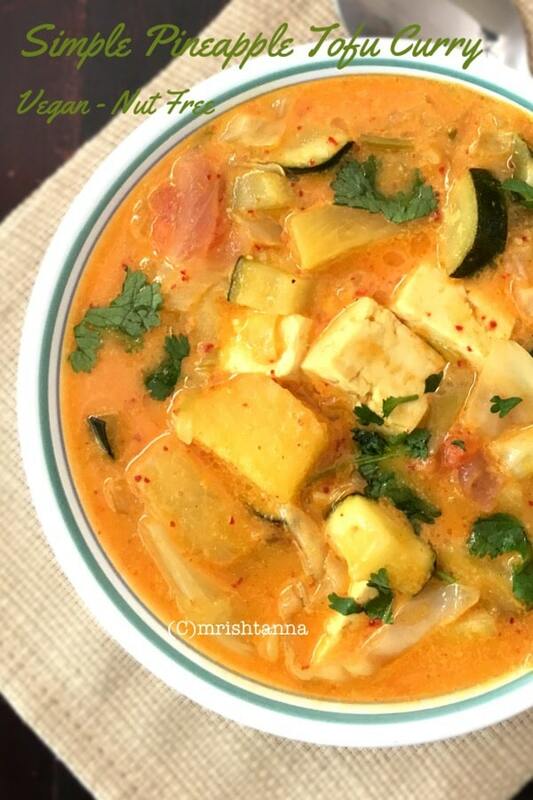 Curry, pineapple, and tofu are so perfect together! I love this and will definitely be making this soon. I’ve been on a tofu kick lately! Love the curry and pinapple! I am definitely going to make this recipe! 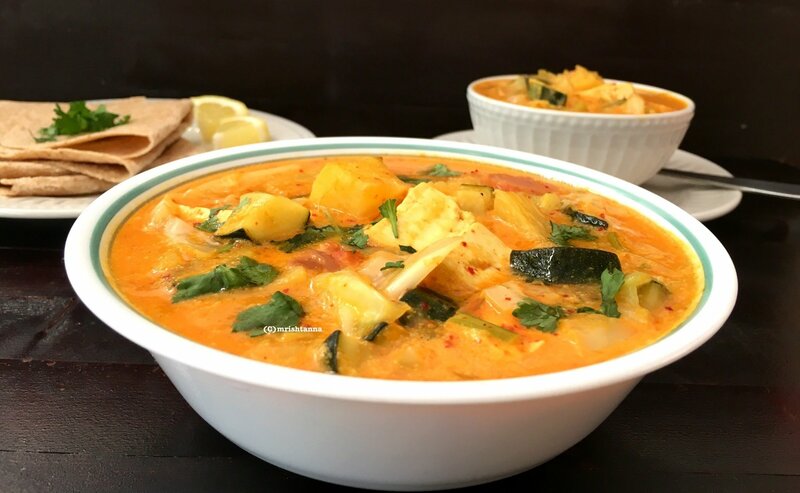 We love tofu curries like this in my house, and the pineapple puts it over the top!